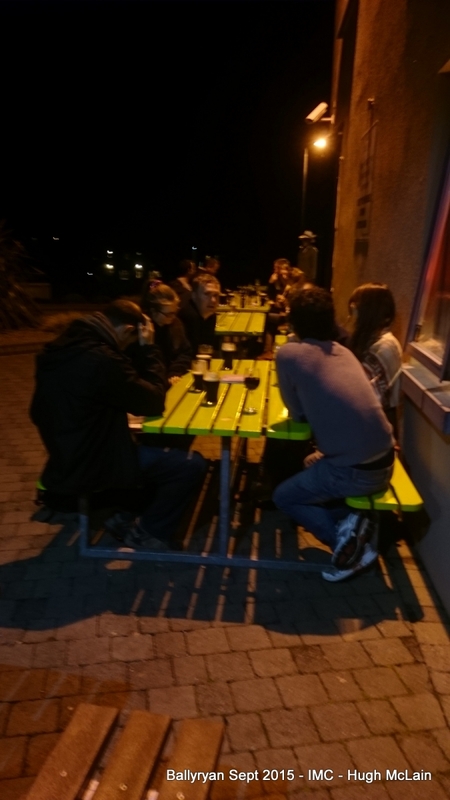 Some of the new members of the 2015 New Member Programme got together 26-28 September 2015 in the Burren Co Clare. 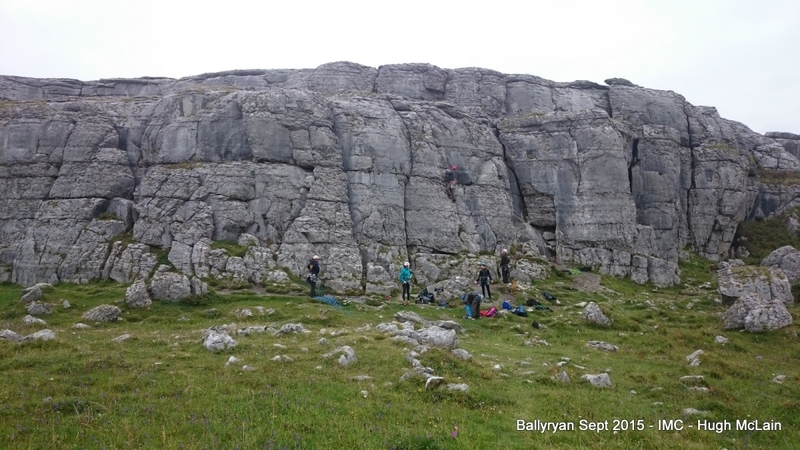 One of our number had recently climbed at a small crag there called Ballyryan and told us there were some nice easy climbs so off we set. I will right this blog from my perspective and hopefully others that were their also put up short blogs also for a richer depiction of the weekend. I arrived to Aille River Hostel on Friday night and had to pitch my tent in the dark, even though I had taken the day off work life still got in the way! On arrival I knew the others, Derek – Thierry – Cedric – Pam – Peter and Emma, were already there and had got for something to eat but they waited until after to put up their tents so we all had a bit of craic. The camping field in the hostel was small but very nice with the river right beside us. We all helped each other pitch the tents and it was done in no time at all. 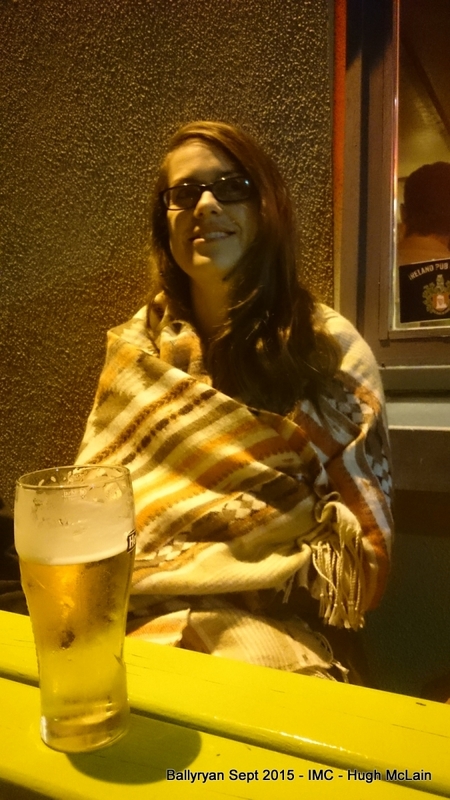 We then adjourned to the local hostelry, Fitz Bar, up the road to plan the next day’s climbing. Pam was elected El Presidente for the weekend. My ambitions for the weekend were to get a couple of Sever climbs done, climb a chimney and maybe look at a Hard Severe or two. On Saturday morning Gina joined us and we set off for Ballyryan, the weather was perfect, dry – bright – slight breeze. We got to there and we were all impressed by the crag. We initially looked at the face and found a few climbs we wanted climb, we then climb an access gully to check out the anchors. We set about climbing then, Peter set up a top rope on Chimney (D) so people could warm up if they wanted. I started off leading Rib (VD), it was a nice little climb and no protection needed until at least half way up. There was not much protect and the little slabby bit at the end was the only tough bit but I got up it no problem. Anchoring at the top was not as easy as in Dalkey Quarry, I missed those gorse bushes, but there was enough with slings, hexes and big nuts. I seconded Aoife (my daughter) up the climb and she liked it, I then belayed a few more so they could experience the climb. I then moved over to Wide Chimney (D) that was no problem. I got the chimney climb in, I had never climbed a chimney before but had a good idea what is was about and really enjoyed it. Then I lead Right Crack (VD) and that was a nice climb with nothing difficult on it and seconded Gina. It was a great morning but it was time for lunch. Breaking with tradition we decided to go back to the hostel, because it was only a 10 minute drive away, for lunch. We had a table to eat at and kettles for hot water, we were only gone for an hour and rearing to go when we got back. After lunch it was time to do the Severe climbs. I started by leading Frost in May (S) and the crux was getting from the ledge to the top. It was a delicate little move but I got it and was chuffed at myself. I seconded Cedric on the climb and Gina followed. We then moved onto Ballyalpine (S) and this was an interesting climb as well, the little traverse to the right was not as difficult as I thought and I managed it with no problem. I was on a high now and just saw Emma on Vulgarian (S) so decide it was worth a go and managed it with no difficulty. I was feeling the strain at this stage and the adrenalin was wearing off. I looked at some HS’s – Left crack, The Alcove Crack and Triumph Crack – but I decided I wanted to finish on the high so decided against it. I now have a reason to go back againJ. Well done to Thierry as he lead Triumph Crack. Gina decided it was time to do her first lead, she had seconded Right Crack (VD) earlier and felt comfortable doing that so off she set with Cedric belaying her. I met her at the top as she wasn’t too confident about anchors and she set them up no problem and seconded Cedric. WELL DONE Gina. Ballyryan was such a great crag for us to visit. It had nice easy climbs to gets us into the swing of it again and a few challenging ones with a few very hard ones if we wanted to be adventurous. I thoroughly enjoyed the day and managed to get all the things on my list ticked off, remember I did say look at some HS climbs. I would definitely recommend it for anyone that wants to get some good climbing done, the only down side is that the crag is not too high so the routes are short. On the Sunday morning the group went in two directions with some going to Lahinch for a spot of surfing and some of us going to Doolin Beach to do a bit of bouldering. The walk into Doolin Beach was long but nice, most of us were feeling wrecked from the climbing the day before. All except Derek “the energiser bunny” who had one climb done before I even opened the mat, three done while I looked at the bouldering guide and five done before I got my shoes on – he was on fire this morning. Derek had been there before so we did a few climbs he knew and general did anything that looked easy (in my case anyway). It was an enjoyable morning and with the long drive ahead of us back to Dublin we finished around lunch time. All in all it was a fantastic weekend with the 2015Newbies getting in a lot of good climbing and surfing. It was not all about the climbing though with a good social element involved. A lot of good friendships have been forged thanks to the IMC New Members Programme 2015. I can’t wait for the next trip away, Glendalough in November was mentioned, looking forward to it.